To celebrate Black History Month this year, the Elgin History Museum’s documentary, Two Boxcars, Three Blocks, One City: A Story of Elgin’s African American Heritage will be rolled out on YouTube during Black History Month in February. 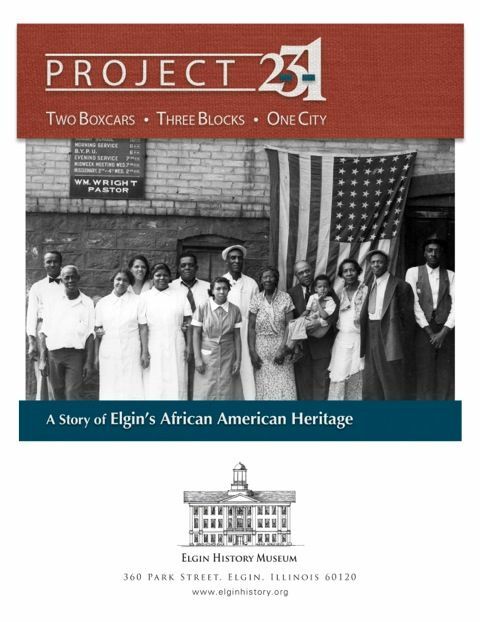 The 75-minute documentary contains extensive interviews, many never seen photos and in-depth histories that will bring to life the story of Elgin’s African American Heritage. YouTube viewing is free with internet connection and can be live-streamed to schools, churches, and community organizations to start a discussion on African American history, social justice, and civil rights. The first act, Two Boxcars, will be available on February 1, 2019 and tells the beginning story of the Kane County Anti-Slavery Society and Elgin’s Abolitionist activities before the Civil War. When the war starts, Union armies march into slave holding southern states creating refugees out of displaced slaves, known as “contraband.” Two boxcars of contraband, consisting of women, children, and the elderly, were moved north to Elgin in 1862. The Elgin abolition community welcomed the 110 contraband into town and helped them to find jobs and homes. The second act, Three Blocks, will premiere on YouTube on February 15, 2019. In this section, community leader Ernie Broadnax leads a tour of the “Settlement” neighborhood in Elgin along Fremont, Ann, and Hickory streets. In the 1860s, the “Settlement” was the only place African Americans, immigrants, and poor people could live. Despite those small confines a community emerged that founded churches, fought for an education and activity centers for their children, celebrated the arts, built businesses, and organized civic organizations. The third act, One City, releases on February 28, 2019 to the Elgin History Museum’s YouTube Channel. This act ends the story with interviews on how Elgin’s African American community stood up against the Ku Klux Klan in the 1920s, and spoke up against injustice with groups such as the Colored Voters Union League formed in 1884, the Elgin Colored Progressive Club in 1924 and the local NAACP in 1920. The community exercised their civic rights fighting racism at home and serving valiantly in every conflict from the Civil War to today. The Project 2-3-1 companion exhibit will be on display in School District 300 high schools, Dundee-Crown, Jacobs, and Hampshire. The exhibit graphically details the development of the African American community in Elgin highlighting individuals who made a difference in each generation. The film can be downloaded to each classroom, while the exhibit will be available in the school library or other public area. Project 2-3-1 was accepted as a significant contribution to the National Underground Railroad Network to Freedom, part of the National Park Service, along with interpretive signage on African American history in Elgin's Newsome Park. The project won five museum awards when it was released in 2015, including national recognition from the American Association for State and Local History (AASLH). The Elgin History Museum, located at 360 Park Street, welcomes visitors Wednesday through Saturday from 12-4pm. The museum highlights Elgin history with two full floors of exhibits an extensive artifact collection and research facilities. For more information on the museum visit www.elginhistory.org, call 847.742.4248 or email museum@elginhistory.org.